IT Security Framework is a set of guidelines, or a kind of template that can be applied to your business and cyber security protocols to protect your security perimeter and minimise your risk of attack. There are many different organisations that can offer you a solid IT security framework for your business and below we’ve provided an overview of some of the better templates that can be used for your own IT security framework. Most of the listed IT security frameworks do focus on a risk-management approach, meaning these guidelines are easily adapted to match your needs, and applicable to your business to target the specific risks that threaten your IT Security. The National Institute of Standards and Technology is the US agency for industry standardisation and measurements. Their cyber security framework adopts a risk-management approach, comprised of three parts. Between them all, these parts cover industry standards, guidelines, cyber security activities as well as the greater context for how an organisation should view cyber security risks. See here. 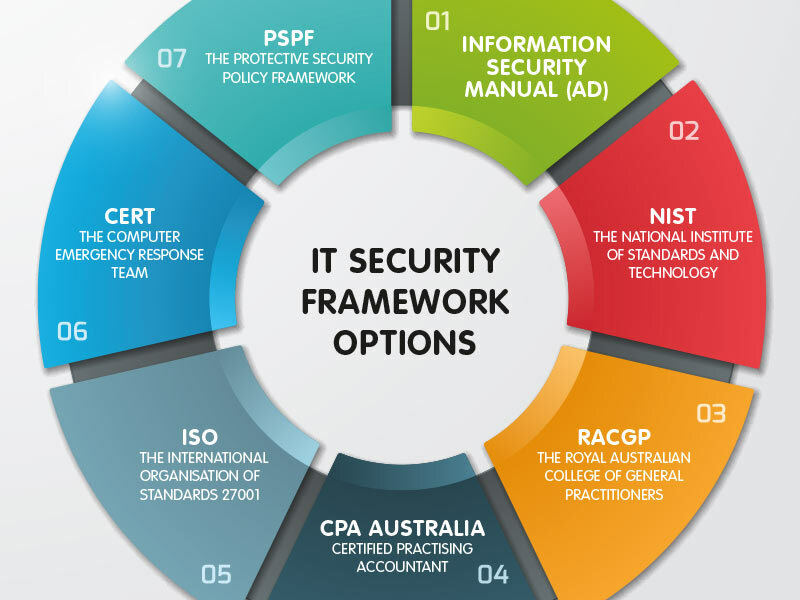 The Royal Australian College of General Practitioners has a set of standards and guidelines they’ve published as their own endorsed IT security framework. It is geared towards businesses handling health care and patient information. This set of standards doesn’t only focus on risk assessment, but also managing availability of information, with backup processes, business continuity and recovery planning, and access management. See here. CPA has built their IT security framework around securing your information and system management, in order to protect client’s sensitive information. They have published an array of articles and even webinars focusing on the best ways to secure and protect your information. Their document IT Checklist covers the whole range of topics on IT system management and cyber security, focusing on a similar approach to the ACSC’s ‘Essential Eight’ steps for security management. See here. The International Organisation of Standards has an established IT security framework titled ISO 27001 that covers all aspects of information security from establishing a management system, through implementation, maintenance and improvement. It emphasises the need for integrating cyber security management across the board of your business, not just in the IT department. The Computer Emergency Response Team provides advice, guidelines and support for mitigating and managing cyber incidents. Their IT security framework includes a remote access protocol that can be implemented into your own IT security framework, a guide to developing an incident response plan, and a document on the top control systems tips that can be cheaply and easily implemented in your business. The Protective Security Policy Framework is a dedicated set of policies and procedures designed to protect assets and information. Their IT security framework focuses mostly on security protocols and information security management. This set of protocols is developed by the Australian government for governmental agencies but can provide the tools and guidelines that can be used by a private organisation. Your IT security framework is the moat and fortress safeguarding your information, networks and business from cyber attack. These frameworks provide you with everything you need to be compliant with cyber security standards, and deliver all the information you need to apply, so you’re not left grasping to figure out what you need to do. Whether you choose to implement one of these as your own IT security framework or choose to mix and match your own protocols and policies to make your own personalised IT security framework is up to you, but either way you are making the choice to protect your business in the best way possible.